Field digital technologies including sensing and diagnostic technologies using IT, network technologies such as FOUNDATION Fieldbus and analyzer bus, and visualizing technologies such as the Field Device Tool/Device Type Manager (FDT/DTM) are indispensable to intelligent field instruments and process analyzers. Meanwhile, user needs have been significantly changing due to changes in the social environment. This report describes the evolution of field digital and sensing technologies in the area of field instruments and process analyzers to address various user needs. Intelligent field instruments and process analyzers accumulate diverse field information including process values and diagnostic results. This data needs to be sent to upper systems such as distributed control systems (DCS) via digital communications such as FOUNDATION Fieldbus and analyzer buses, or hybrid communications such as HART and Brain, and visualized to enable the customer to utilize them for plant operations and maintenance. Figure 1 shows the field digital technologies used for this purpose. Users' needs for field instruments and process analyzers including differential pressure transmitters and flow meters long offered by Yokogawa have significantly changed in recent years with the changes in our society. There is thus a need to evolve these instruments to meet changing needs in the areas of power saving, improved operability, and long-term stability, and in accordance with the evolution of sensing technologies. This paper describes the evolution of field digital technologies and sensing technologies. 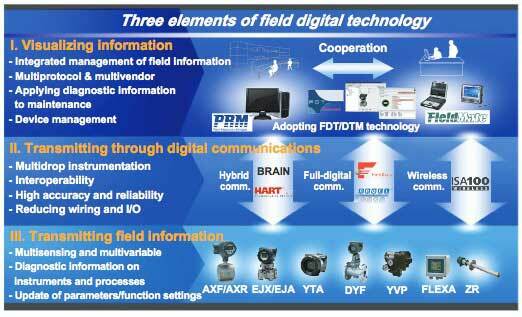 This section describes the elements of field digital technology shown in Figure 1. 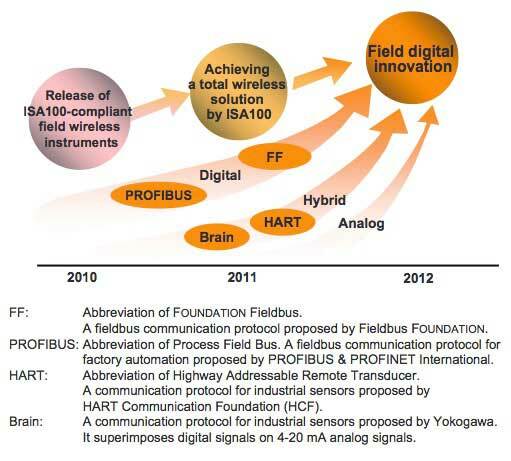 Yokogawa released the first FOUNDATION Fieldbus- registered products in 1998, and have been improving their performance and usability ever since1. Field instruments have built-in function blocks for PID control, complex calculation and so on, and some functions that upper systems conventionally have are implemented in the instruments themselves. The field instruments are equipped with a software download function first implemented in the world by Yokogawa, which downloads and updates software programs running in the instruments via the fieldbus. Although this function was standardized by the Fieldbus FOUNDATION, Yokogawa has not only led the industry in this area but also provided high value-added solutions to its customers by participating in the standardization activity since the draft phase and introducing the standardized functions early. The fieldbus has made use of the most of the intelligent functions of instruments such as multivariable differential pressure transmitters, vortex flow meters, and Coriolis flow meters. These instruments can transmit multiple process values such as mass flow rate, volume flow rate, and fluid temperature through a single physical line. Thanks to the evolution of electronics including CPUs and memories used in them, they can carry out many diagnostic calculations with a low current consumption. Such diagnostics include detection of impulse line blockage in differential pressure transmitters, predictive diagnosis of maintenance time for sensors in analyzers, and valve diagnosis in valve positioners.2 These are the information transmitted by the intelligent instruments in the field. As shown in Figure 2, wireless communication is a major innovation in field digital technologies. Yokogawa announced in 2009 that it will promote the standardization and dissemination of the ISA100.11a international standard proposed by the International Society of Automation (ISA), and in 2010 released the world's first products based on ISA100.11a. Users show high expectations towards wireless communication in the hope to extend applications and reduce implementation costs. The features of Yokogawa's ISA100-based products are as follows. Easy power-supply cell maintenance in hazardous areas The cells are encapsulated in an explosion-proof case. Supports both mesh and star topologies When star topology is selected, the network is stable even in high-speed operations, power consumption is minimized, and battery life is prolonged. Expandability and consistency with existing systems The network can be progressively expanded without wasting customers' assets. Yokogawa sees wireless communication based on ISA100.11a as an evolutional step of field digital technology leading to dramatic innovation, and thus will continue to focus on it and provide solutions based on it to customers. The global social environment is significantly changing. Shift to new energies and energy saving are increasingly required aiming to break away from depending on fossil fuels. At oil/gas drilling sites and the like, devices require high resistance to temperature, pressure and corrosion due to changes to harsh location. Safety functions are also required for safe plant operations and compliance with regulations is becoming stricter. Moreover, products must be cost- competitive to correspond to the rapid growth of industries in emergent nations such as China, India, and countries in Southeast Asia and South America. It is not easy to offer all products while meeting these demands. Added value must be created for customers, in addition to ensure cost-competitiveness and basic performance by designing the basic elements of instruments such as electric circuits, firmware, and system architecture as common platforms. As for sensing technology, which is essential for all products, long-term investment for development is often necessary. Yokogawa has unique sensing technologies including silicon resonant sensors5 which utilize the micro electro mechanical systems (MEMS) in differential pressure/ pressure transmitters, and the dual frequency excitation method in magnetic flow meters. 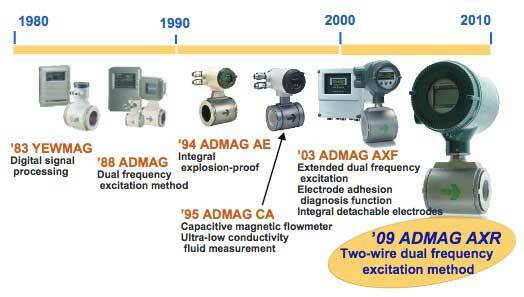 As shown in Figure 3, Yokogawa has been offering magnetic flow meters since the 1950s and launched the ADMAG AXR two-wire magnetic flow meter in 2009. With new technologies such as high-density coils, we have succeeded in developing the world's first two-wire magnetic flow meter with dual frequency excitation, which outperforms competing products. This innovative sensing technology meets energy saving demands. Process analyzers generally have more complex mechanisms than field instruments such as transmitters, so their measurements are susceptible to surrounding environment changes and time- dependent changes. Moreover, they have interference errors due to changes in the composition of measurement samples and are easily affected by contamination with dust and mist. Therefore, sampling devices are often installed, so that the temperature and pressure are adjusted, and dust, mist and corrosive gas are removed, and then measuring samples are sent to analyzers. This tends to make the entire system complex and expensive. Daily maintenance of sampling devices is indispensable for the stability of process analyzers. Periodic validation and calibration are essential to confirm and maintain accuracy of measurement. In these circumstances, the common challenge when developing new process analyzers is to improve reliability, operability and maintainability, while reducing the lifecycle cost. Intelligent self-diagnosis functions of analyzers have been enhanced to ensure the reliability of measurements and minimize maintenance. These self-diagnosis functions include not only simple failure diagnosis but also those that transmit preventive and predictive maintenance information. Because the deterioration diagnosis, replacement prediction of sensors, etc. are influenced by their installation environment, operating information from the field is indispensable to improve the accuracy of prediction. Many analyzers are installed in plants, most of which are set up in a hut called an analyzer house with sampling devices, except for the direct-insertion type ones such as pH meters, zirconia oxygen analyzers for combustion control, and laser gas analyzers. Operation, maintenance, and management of all these devices is a huge burden for users. An analyzer bus, which uses a dedicated high-speed bus, is an effective way to collectively manage analyzers in a plant. Because some analyzers such as gas chromatograms output huge amounts of data, a high-speed bus is required. 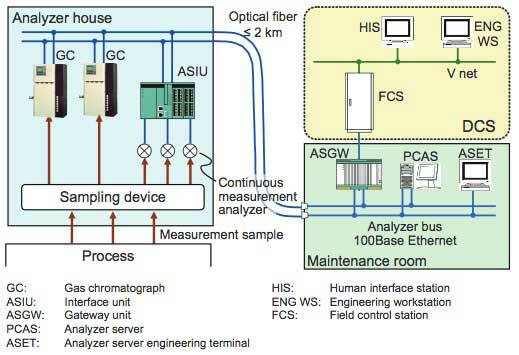 Figure 4 shows the overview of an analyzer bus system. The analyzer server (PCAS) collects measurement data, monitors self-diagnosis information and operations, and issues instructions for validation and calibration. It is connected with control systems such as a DCS through a gateway (ASGW), independent of the analyzer server. Since individual analyzers such as gas chromatographs can be operated remotely at the analyzer server, data collection and changing operating parameters necessary for maintenance can be performed without going to the site, which reduces maintenance work. Users seek process analyzers which enable unprecedented process control. For example, they want to measure quantity or quality online that can only be analyzed in a laboratory, and want to use the continuous analysis information to improve process efficiency. Yokogawa's NR800 near-infrared analyzer can replace laboratory analysis with continuous measurement, though its measurement method is different from those for laboratory use. In some cases, needs are not apparent and can be overlooked by vendors. Therefore, users and vendors should work together to achieve practical use. If the accuracy, responsiveness, long-term stability, reliability, and maintainability of existing analyzers are improved considerably, they can be incorporated in the control system to improve the process control. Take laser gas analyzers, which are remarkably used in recent years, as an example. Yokogawa's TDLS200 laser gas analyzer can respond quickly because it is directly integrated to the process line without any sampling device. Furthermore, since it includes no delicate optics, it has excellent stability, and no calibration is necessary for a long time. In fact, maintenance services by staff are not necessary for more than one year. These structural features ensure sufficient reliability to be incorporated in control loops. Analyzers are relatively expensive and need high maintenance costs, and so there is a need for reducing lifecycle costs including not only initial costs but also maintenance costs. There are various ways of achieving this. For example, the FLXA21 modular two-wire liquid analyzer can accommodate up to two sensors saving installation costs and perform calculations using these two inputs as well. Since the input circuits are implemented in a module, users can choose any two modules among those for measuring pH/ORP (ORP: oxidation-reduction potential), conductivity, electromagnetic conductivity, and dissolved oxygen, and put them in the common case. The combination of the common case and dedicated modules facilitates change of usage and reduces spare part costs. Another example is the OX400 low concentration oxygen analyzer. Compared with previous models, the lifespan of the oxygen sensor is far longer and maintenance costs are lower. In addition, down time is reduced because sensors can be replaced in the field, while previous models needed to be sent back to the factory to replace the sensor. Process analyzers must continually offer better reliability, operability, and maintainability. By adding intelligent functions, analyzers have become easier to use and measured values more reliable by combining ever-advancing self- diagnosis functions and validation systems. Moreover, they can be maintained on predetermined schedules based on preventive maintenance and predictive maintenance information. 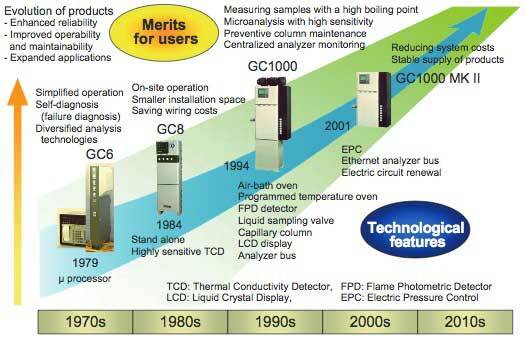 Figure 5 shows the evolution of Yokogawa's process gas chromatograph, explaining the technological features and user merits. It is clear that intelligent functions have greatly contributed to improving the reliability, operability, and maintainability of analyzers. Meanwhile, the analyzing part of analyzers continues to change substantially. For example, high reliability, quick response, and high stability have been achieved in the TDLS200 laser gas analyzer by designing it as a direct- insertion type analyzer utilizing a laser with long-term stability. This is an epoch-making breakthrough different from the usual evolution of conventional gas analyzers. Process analyzers are enjoying the advantage of intelligent functions added. They will continue to be evolved to achieve higher reliability and stability, and quicker response by innovating and improving their analyzing and sensing mechanisms. Sensors for field instruments, process analyzers, etc. will remain key elements in many industries. How the global social environment changes, sensing technology is indispensable. 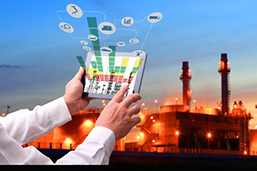 Yokogawa will continue to develop sensing technologies and related field digital technologies in order to provide customers with optimum measurement and control solutions. The Coriolis flow meter, FieldMate, ADMAG AXR, NR800, TDLS200, FLXA21, OX400, ISA100-based products, and diagnostic functions of differential pressure/pressure transmitters referred to in this paper are described in other articles in this special issue; please refer to them for details. ADMAG, AXF, AXR, EJX, EJA, YTA, DYF, YVP, FLXA, FieldMate, PRM, VigilantPlant, and TDLS are all registered trademarks of Yokogawa Electric Corporation. FOUNDATION Fieldbus, HART, and PROFIBUS are registered trademarks of the Fieldbus FOUNDATION, the HART Communication Foundation, and the PROFIBUS & PROFINET International, respectively.